In early September we embarked on another 500-mile road trip to Grover Beach from Bakersfield in our 2015 Nissan Leaf. 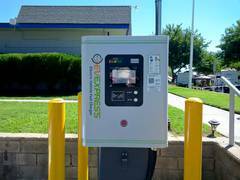 The trip was in part to visit a friend and in part to test the performance of two new DC Fast Chargers (DCFC) in the Tejon Pass. The new charge stations offered the prospect of substantially cutting the time necessary to cross the pass on I-5 with a mass-market EV. See New Network of Fast Chargers. The two new stations, one in Gorman and the other in Castaic, delivered on the promise, cutting nearly two hours off the one-way travel time. The Leaf is a mass-market electric vehicle (EV) with a limited capacity traction battery. This is in contrast to high-end Teslas with much larger batteries. The official range of the 2015 Leaf is 84 miles, providing a working range of 50 to 60 miles. However, crossing the Tejon Pass requires a long and steep climb to the summit that substantially cuts the working range. I-5 is the major north-south corridor transiting the Tehachapi Mountains from the San Joaquin Valley into the Los Angeles Basin. Drivers of BMW i3s, Mitusibishi Mievs, and Leafs have complained for years that there were an insufficient number of DCFC stations in the southern San Joaquin Valley and no stations in or near the Tejon Pass. To cross the summit drivers of mass-market EVs had to stop at the Flying J truck stop in Lebec and connect to Shorepower’s truck terminals with their portable charge cables. This necessitated a long layover, sometimes as long as two hours or more. The stations were installed by the US Green Vehicle Council and the Cleantech Institute under a grant from the California Energy Commission (CEC). The $500,000 grant covered ten stations in all. The stations are part of the EV Express network. The original proposal included a station on the valley floor at the base of the Grapevine, which would have made an easy drive from anywhere in Bakersfield. The station was then moved to Lebec, again a doable distance in a relatively new Leaf from Bakersfield. In the end the station was installed at a motel in Gorman just below the summit on the south side of the pass. The second station was originally proposed for a hotel near Valencia. The final site at an RV park in Castaic is closer to the pass and north of the interchange of I-5 with Hwy 126 a major east-west corridor to the coast. The two stations are 28 miles apart. The Gorman DCFC station is 45 miles from our home in northeast Bakersfield. It’s on the edge of the range we are comfortable with traversing the pass. We reached the summit with 20% State of Charge (SOC) and arrived at the station with 22% SOC. However, we drove very conservatively with most of the ascent up to the pass in the truck lane at crawl speed behind a truck obviously struggling to summit. In the future we’ll drive faster, but not by much. 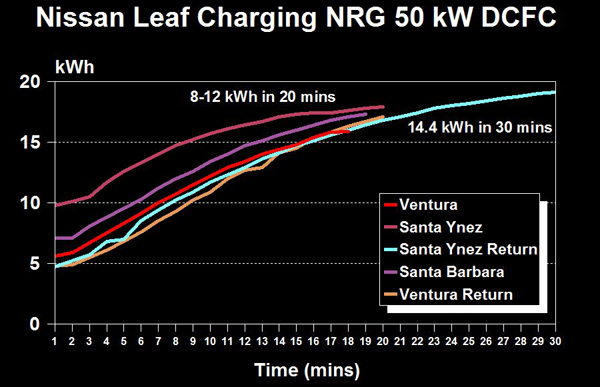 Our Leaf is now two years old and has lost about 10% of its original battery capacity. I like to maintain a reserve of 15% to 20% SOC on a familiar route, more on an unfamiliar one. By the end of our lease, we expect the Leaf to have lost 15% of its capacity, pushing the 45-mile trip over the summit to the Gorman DCFC station into the safety reserve. The reserve traction battery capacity is important on this route. There are no J1772 Level 2 stations in Gorman. If the DCFC station is down, it would likely be necessary to drive back up to the summit and then down to the Flying J in Lebec. The CEC grant called for 25 kW stations. These are a departure from the 50 kW stations installed, for example, by EVgo. In terms of capacity, they are similar to the 25 kW DCFC stations being installed by ChargePoint with BMW and VW on the Hwy 101 corridor. The EV Express stations have only a CHAdeMo connector. There is no provision for CCS used by BMW and VW. In practice, the 25 kW stations deliver 20 kW to the vehicle. Likewise, the 50 kW stations deliver 40 kW to the vehicle. 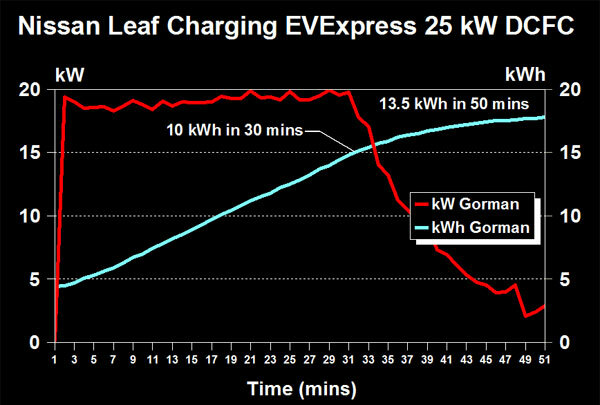 Thus, EV Express’ stations are “slow” fast chargers relative to the 50 kW versions operated by EVgo. The contractor argues that longer charge times are minimal on the 25 kW stations in comparison to the 50 kW chargers. Moreover, the 25 kW chargers are easier to locate at small businesses, such as motels, because they don’t require as much electrical infrastructure as the 50 kW chargers. EV Express operates its own network. A payment app can be downloaded for Apple and Android, the system can be accessed on line, or drivers can purchase RFID cards from the businesses where the stations are located. The android app wouldn’t work on my Blackberry running OS 10, an operating system capable of running android apps such as plugshare.com. I ordered an RFID card on line, but it didn’t arrive until well after our trip. I bought a card at the Studio 6 Motel in Gorman and the card worked on the first try. EV Express expects to offer online access to users so users can monitor their accounts. That’s not the case today, but EV Express does readily answer the phone and will swap funds from one card to the other. The RFID cards only work when there’s a balance in excess of $10 on the card. Some drivers have complained that the $0.59 per kWh and a service fee of $2.95 the network charges are too high. We don’t have a problem with paying for services and if EV Express maintains these stations and keeps them operating, we’ll consider the money well spent. The stations enable us to use our Leaf without a long layover at the Flying J truck stop, which now has no restaurant. There are a little more than 20 usable kWh in the traction battery of our two-year old Leaf. On a road trip such as this we typically need 10 kWh or more for the next leg. I log data from the dash display as well as data from Leaf Spy. Later I download data from Leaf Spy in a spreadsheet that contains volts, amps, gids, and much more. The data is presented in one-minute blocks. The EV Express 25 kW stations do take longer to charge. That’s inescapable. It’s not much longer, but it’s longer. In our case, it took about 20 minutes longer to deliver 13-14 kWh to the car relative to a 50 kW charge station. 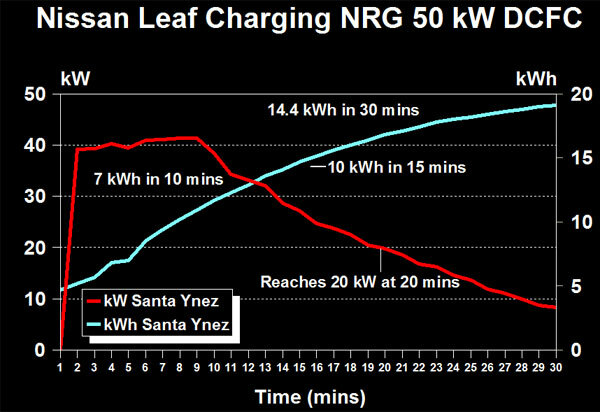 Specifically, it took 50 minutes to deliver 13.5 kWh in Gorman, versus 30 minutes to deliver 14.5 kWh at a 50 kW EVgo station in Santa Ynez. At Gorman, the EV Express station delivered 3 kWh in 10 minutes and 10 kWh in 30 minutes. 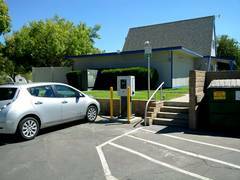 At Santa Ynez, the EVgo station delivered 7 kWh in 10 minutes and 10 kWh in 15 minutes. 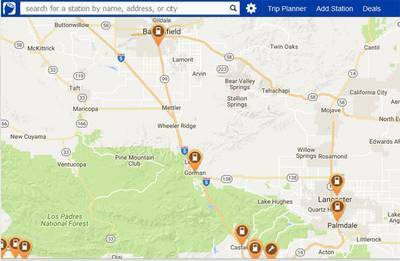 EVgo has yet to install a much talked about station at the base of the Grapevine. In the meantime EV Express is the only DCFC station on this route. Typically, we need 8 to 12 kWh at a DCFC stop. The EVgo stations can deliver this in less than 20 minutes. Installation of the new stations allowed us for the first time to drive from Bakersfield to the coast and return using only DCFC stations. This reduced our travel time nearly two hours on what was a ten-hour trip. Our use of the new stations was not trouble free, but EV Express answered our calls immediately and walked us through what we needed to do. I couldn’t figure out how to turn the units off. The touch screen wouldn’t do it. The “stop” button wouldn’t do it. So I pushed the release button on the connector. This usually interrupts the communication between the car and the charger and stops the charging. The connection light in the handle then turns off and it’s safe to remove the connector. This technique worked for me in Gorman, but when I tried it at Castaic it didn’t work. I called EV Express and they suggested pushing the emergency stop button. I did. That stopped the charging. I removed the connector then I reset the charger and drove on our way. The two stations worked for us and we’re happy they’re there—finally. We’ve been waiting nearly two years for these stations to be installed.